Exxelia Magnetics specializes in the design, marketing and production in small quantities of high precision inductors and transformers for high-performance applications in high grade electronics. Our R&D department with their PhD doctors, engineers and dedicated technicians represents 15% of our employees. They constantly offer innovative and performing solutions in perfect synergy with the National Center for Scientific Research (CNRS), National Center for Space Studies (CNES), high schools and labs. Our expertise ( 5 thesis developed whith university laboratories ) is recognised worldwide in the domain of magnetic phenomena, the design of components and comprehension of their applications. Our success is based on already qualified technological solutions which allow us to respond quickly to our customers specific requirements. The SESI power inductors 9.1 to 18 are European Space Agency qualified. These components have been designed during the last 8 years in order to offer simple functions (SESI 9 to 18 chokes) and/or to be adapted to big volumes in the automotive market. 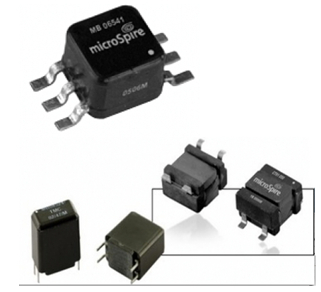 Microspire also designs complex functions (flyback transformer, current transformers, forward transformers, gate drive transformers, push-pull transformers, common mode chokes, multiple chokes…) . Chip Inductors series are usually installed on Military applications and breadboards for Space applications. Since January 2003, Microspire has been manufacturing Radio Frequency Fixed Coils, MPCI 10000, 12000 and 20000 series fulfilling ESA ESCC Generic specification N° 3201 and detail specification N° 3201/00x. This range is named MSCI (S for space applications). This qualification approval includes final production tests Chart II, burn-in and electrical measurements to testing level B Chart III and qualification testing Chart IV. As per MIL-STD 1553 A & B. Meet all the electrical requirements of Manchester II serial bi-phase data transmission, 1 MHz operation. Available in different sizes, in SMT or DIP packages. Already qualified by the CNES for space applications (ESCC Capability Approval in progress with the European Space Agency) Microspire’s «SESI Technology» planar solution for high grade common mode chokes. Three standard packages in a qualified technology for extreme working conditions. Compliant with MIL-STD-202, ECSS-Q-70-02 (aerospace) and DO-160 (avionics) standards.